Fill out an availability form for each event (attached), and return to footballmanager@cardiffdragonsfc.co.uk. This Thursday training we will again be at Gol Centres at 9pm on astroturf. Please could everybody try to get there around 8:30 so we can be ready and warmed up when the court becomes free. You will need astroboots or moulds as no studs can be warn on the pitch. Numbers have been excellent at recent sessions and we have unfortunately had great difficulty in getting an 11-a-side facility. We need to start arranging things for this event. It is a good tournament with a fun party afterwards. We can go as Dragons teams or you can chose to be in a mixed team with players from around the country. We need to sort accommodation and team entry so we would be grateful if everybody could let us know what they are doing. Usual channels are fine. Our second fixture of the season against Exeter sees the Lions come to Cardiff for the first time. We played recently in a development game and lost 0-7. We will be looking to put in a good showing against a strong emerging side in the GFSN structure. This will be a cup match and technically we are still in the tournament. We may be tempted to alter the make up of the squad which plays, and will make a decision shortly. The considerations will be whether we go into the match all guns blazing, whether we use this fixture to develop players or to mix and match who plays. The week after will be a league match against London Leftfooters, so it could be an ideal warm-up match for this. What would you like to do with this fixture?? Either way we need to know who is available, and we want to have as many people as possible, so please could you e-mail Murray footballmanager@cardiffdragonsfc.co.uk with your availability for this fixture. After this weeks victory against Birmingham, we have another very important game that could affect our season. We are currently sitting second in the table and must now aim for promotion. As we have also never beaten Leftfooters in a 90 minute game we will be looking to turn the tables on our rivals. It is important that we get as strong a squad as possible to this match and we are urging everybody to do their best to get themselves free on this date. 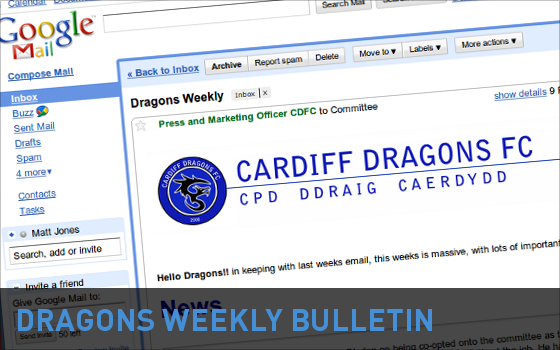 Please could you e-mail Murray (footballmanager@cardiffdragonsfc.co.uk) with your availability for this fixture. It is with a heavy heart that I have this week received Ant’s resignation from the role of Secretary. Ant has been, for the years since first joining, a rock for this club. He has supported us in all aspects of club operations, from the pitch to the office, and his contribution to the way the club is run, to the way we play, to the successes on and off the pitch, cannot be dulled. He deserves all of our gratitude for the work he has put into helping to make the club a success, especially through some very testing times, and I hope that he will continue to do so in the future. This does, however, open up a position on the Committee that will need to be filled as soon as possible. Attached are the forms, containing job description and application, you will need to complete and send to me if you would like to be considered for the position. Applicants will be invited to the next Committee meeting, and a member will be co-opted into that position during the meeting. The role of secretary is a tough but reward one, which will see the member managing much of the day-to-day operation of the club, including co-ordinating two other committee members, taking minutes at meetings, and other duties. Hello all. I know it’s a bit early to be giving a chrimbo message, but to steal a line, “money never sleeps”. Therefore can I please remind everyone about www.easyfundraising.org.uk. I know how generous the Dragons are and I’m sure you’ll be buying lots of gifts online for your friends and families this year. Easy fundraising has links to all the popular retailers. For example, Amazon, Argos, Tesco, B&Q, and many more. If you are buying online the chances are there is a link on easy fundraising. All you need to do is follow these steps to raise money for the club, at no extra cost from you. Go to www.easyfundraising.org.uk and sign in/create profile. If you’re a first timer please remember to choose Cardiff Dragons as your chosen good cause. Click on the retailer you wish to buy from. If done correctly a small percentage of the retailers profit will be given to the Dragons for free (usually about 2.5%). To steal another line, “Ask not what your club can do for you, ask what you can do for your club”. Easyfundraising has a sister site called Easysearch. This works in a similar way to Easyfundraising whereby our supporters use it (as a search engine this time) and we get 50% of advertising revenues paid to the site as a result. Cardiff Dragons now has a page through this. You don’t have to buy anything for us to make money; the site earns advertising revenue when someone clicks a link they find and it goes to a supplier’s page. It really is money for nothing!! Things are now finalised for the Dragon’s Christmas Party 2010 on Saturday 18th December 2010 (from 7pm onwards) which is to be held at “Bar Icon” on Charles Street. The cost for the buffet is £7.50. We will be giving a £2.50 subsidy per member, hence £5 for members and £7.50 for non-members. (cut off date for new members is 27 November) Full payment is required to be made to Dave Keith by 5 December. Cash, cheques or electronic transfer accepted. Also, don’t forget to reply to Richie if you are interested in the Secret Santa. For all Social News please visit the Social page.